The Miami University department of theatre will host a production of “The Every 28 Hours Plays” at 7 p.m. Saturday, Oct. 22, in Gates-Abegglen Theatre, Center for Performing Arts. The performance is free and tickets are not required. Miami’s production is one of many performances of the project scheduled around the country this month. “The Every 28 Hours Plays” is co-created and produced by Dominic D’Andrea of the The One-Minute Play Festival and Claudia Alick of the Oregon Shakespeare Festival. The title of the project is inspired by the widely shared and contested statistic that every 28 hours a black person is killed by a security guard, a vigilante or police in the U.S. It emerged from “The Ferguson Moment” project created by Alick in August 2014 in response to the death of Michael Brown by police in Ferguson, Missouri. 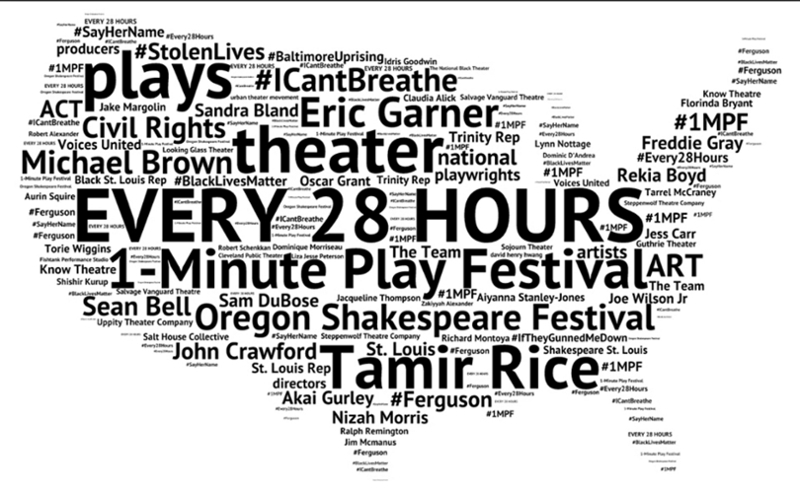 "The Every 28 Hours Plays” project was created in three phases. In phase one in 2015, theatres and playwrights around the country connected to create a selection of one-minute plays on the theme of "The Ferguson Moment" or sent artists to St. Louis to develop the work on the ground (Ferguson is part of the Greater St. Louis area). During phase two, guest artists traveled to St. Louis to engage in a week of artistic exchange with St. Louis-based artists. Phase three consists of the plays being produced all over the U.S. with concentrated programming taking place this month. Miami’s production is led by Ann Elizabeth Armstrong, associate professor of theatre. Introduction – Wilson Okello, doctoral student in student affairs and higher education. Race – Denise Baszile, associate dean for student services and diversity, College of Education, Health and Society, and associate professor of educational leadership. Police – Bekka Eaton Reardon, associate professor of theatre, Miami Hamilton campuses. Community –David DeVita, master’s student in theatre. Protest – Jordan Dinwiddie, senior international studies and theatre double major and president of the student organization The Walking Theatre Project. History – Katie Johnson, professor of English. Mothers – Roxanne Ornelas, professor of geography and women’s, gender and sexuality studies. Youth –Rebecca Howard from the Oxford Area Community Theatre (OxACT). “This is a national conversation, and social media allows us to share our local production and engage with other productions going on all over the country simultaneously,” Armstrong said. On Twitter look for #Every28MU and @Every28MU and Facebook.com/Every28HoursMiamiOH. Those interested are invited to stay after the show for a post-show discussion led by Durell Callier and Mahauganee Shaw, assistant professors of educational leadership, and Dominique Hill, scholar-artist and resident artist at the Oxford Community Arts Center.